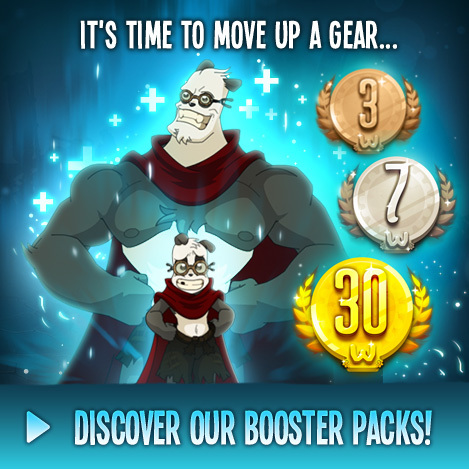 After have gone all out – no, not on the town – with the gods, it's back to class for the packs! The Foggernauts are kicking things off by offering you the most steaming-hot pack of the year until September 26. The future of the next Boss Smasher costume is in your hands! Come vote for your favorite design and you just might see it in the game. A few weeks ago we celebrated the anniversary of Ogrest's arrival, now we have another reason to celebrate! "Ardent defender of the environment, I'm the daughter of a god. After discovering me on an island in your beloved MMO, you saw me in flesh and bone (or almost) in Season 3 of the animated series. To celebrate the anniversary of its air date, I'm holding a flash sale on my costume in the shop! Who am I? I am…"
The new Mystery Box is full of something to get your emotions flowing: emotes! We know how much you love those little animations that let you communicate, share your emotions, and bring your characters to life (even more)! The Myster'Hit Box is available through September 16! With 20% off certain items, the Shop's holding its own little braderie sale. You have three days to sniff out bargains in the "Series" and "In-Game Items" categories! There are those adventurers who leave the sour smell of a long day of fighting in their wake. And then there's you. Well, I mean, and then there could be you! What would you say to spreading flowers by the dozen with every step you take, like a messenger sent to spread loooove and peace in the World of Twelve? With the Botani'Run, you can! After WAKFU The Brotherhood, Nindash, Drag’n Boom and Tactile Wars, Ankama Mobile is releasing its newest mobile game, Cosmobot. This ultra-dynamic, one-button mini-game on mobile has drones, outer space, gravity… and a super cute mechanic! As the last primordial dragon egg is coming to DOFUS, an event closely linked to Krosmoz lore and background, Gamakna had to go all out, and so took the opportunity to return to the myths and legends that make all our games come alive… including WAKFU! At the top of the mountain, Ogrest the Terrible spreads chaos to the World of Twelve for over a year now. Here's your chance to discover the mysteries of Mount Zinit, even if you don't have a Booster! We've announced it in Ankama Live, now it's time to make it a reality! Join our contest and show off your design flare, and who knows, it might become this year's Boss Smasher Costume! The Shop is having a flash sale on the Natroyal Costume – pick it up for 2,500 Ogrines until September 3! Those who've already worn it are unanimous: Once you slip it on, you'll be in the grip of telluric forces, ready to burn any wood to achieve your aims. And then, you'll be no one's… sap! Get ready for a hard-hitting event, the Boss Smasher! Complete the Stasis version of the Castuc Dungeon between August 23 and 27 to get exclusive rewards! A warrior as courageous as he is reckless, Iop set the stage for a goddess adept in martial arts: Pandawa. She's taking over the reins in this new God Pack! The Beta server has been updated this Friday, August 17th. Discover the latest developments, changes, and don't forget to share with us your feedback! The merchants of the World of Twelve have decided to extend the summer sales! From today through August 20, take advantage of a 30% sale on all consumables. Don't miss out! The organization of the tournament progresses smoothly thanks to our consultants, but today we'd like to hear from you! Do you feel like playing? Then all you have to do is play! Would you like to win a booster to play more? Then all you have to do is play! Until Friday, August 17, buy a booster, play for at least eight hours, and… win a free booster! In an earlier newsletter, we told you about an inter-server PvP tournament. This time, we'd like to talk about our ban system.